Safety matters. And safety technology is a clear leader in qualities that boost consumer satisfaction with the cars and trucks they've purchased. Overall, people are happier with their vehicles, according to J.D. Power's 2015 U.S. Automotive Performance, Execution and Layout (APEAL) Study, which looks at how gratifying a new vehicle is to own and drive, expressed as an index score on a 1,000 point scale. The industry is up four points versus last year per the firm, which says safety technology is the driver; and blind-spot alert technology, in particular. The take rate on blind-spot monitoring technology is also way up, per J.D. Power. The study found that 36% of owners have the feature, a seven percentage-point increase versus last year. But the adoption of other safety technologies by buyers is also up. Twenty-one percent have lane-departure warning systems, a five point increase; and 46% have park assist/backup warning, a four percentage-point increase. A quarter of consumers have collision avoidance/alert systems. The APEAL is is fundamentally different from the firm's Initial Quality Study (IQS) and durability study, which rank vehicles and brands by reported problems. The APEAL looks at things gone right, things people enjoy about their new car. The data is based on responses from over 84,000 purchasers or lessees after 90 days of ownership. The poll was done early this year. 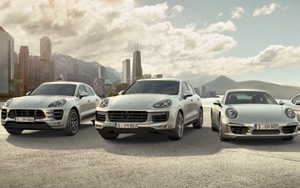 In the APEAL study, in its 20th year, Porsche ranks highest overall for the 11th consecutive year. After Porsche are Jaguar, BMW, Mercedes-Benz, and Audi. Mini is the highest-ranking non-premium brand in the study. Stephens said Jaguar is in second place for a second year, and BMW moved up from sixth place to third. “Mercedes has moved well,” she said, noting that the luxury brand moved up three ranks with an 11 point increase, while Lexus moved down from six to to ten, “The largest decline of any premium brand.” She added that Volvo improved the most of any premium brand, up 13 points. Mini improved over 30 index points, the most of any brand in the industry, largely because of the launch of the new Mini Cooper, per Stephens. Volkswagen also did very well, up ten points thanks to its Golf. And both GMC and Ford both moved up. For Ford, the improvements were driven by the F-150 pickup and Mustang, 49 and 59-point improvements, respectively.